Set operators combine the results of two queries into a single one. The following set operators aid SQL in joining queries to retrieve rows. Now let us discuss them in detail. SQL Server provides the UNION, EXCEPT and INTERSECT set operations which work on complete rows from two queries to generate one result set. They are drawn from the fundamental operations of set theory. SQL Server does not currently support an EXCEPT ALL or INTERSECT ALL. The Columns in the select statements joined using the set operators should adhere strictly to the norms mentioned below. 1. The queries which are related by a set operator should have the same number of columns and the corresponding columns must be of the same data type. 2. Such a query should not contain any column of type long. 3. The label under which the rows are displayed are those from the first select statement. The union operator returns all distinct rows selected by either query. 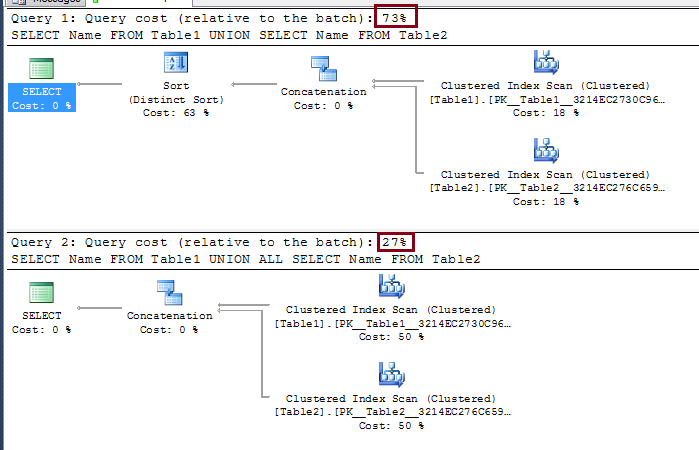 The following example combines the result of two queries with the union operator which eliminates duplicate rows. The "Union All" operator returns all rows selected by either query including duplicates. The following example combines the result with the "Union All" operator, which does not eliminate duplicate rows. UNION will take the extra step of scanning the result set and presenting you with ONLY distinct rows. So it is going to perform slower because it has to sort the result set. UNION ALL does not have to take the extra step of scanning the result sets and extracting only the distinct values, so UNION ALL is usually better performing than UNION, because it does not have to sort the result set. So UNION ALL gives faster results. The execution plans for those two queries shows. But this does not mean you use UNION ALL in every scenario. Intersect operator returns only rows that are common to both queries. Except operator returns all distinct rows selected only by the first query and not by the second query. The above example displays distinct rows selected by either query, ordered by the second column stated in both the queries. Since the column names are different in the above queries. We use an integer in the "Order by" clause instead of name. INTERSECT, EXCEPT, and UNION are all set operators that act on a minimum of two queries. INTERSECT and EXCEPT can be re-written in several different ways, using joins or utilizing IN/NOT IN within the WHERE clause.